IBM Information Server is a revolutionary new software platform that helps organizations derive more value from the complex heterogeneous information that is spread across their systems. It enables organizations to integrate disparate data and deliver trusted information wherever and whenever needed, in line and in context, to specific people, applications, and processes. 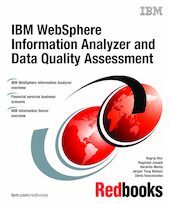 IBM WebSphere Information Analyzer is a data profiling and analysis tool that is a critical component of IBM Information Server. It is designed to help business and data analysts understand the content, quality, and structure of their data sources by automating the data discovery process. Bundled with IBM WebSphere Information Analyzer is AuditStage, a data rule monitoring tool that is designed to help business and data analysts validate data and assess ongoing data quality trends. This book describes a usage scenario that covers all dimensions of profiling, rule building, deployment, and quality monitoring through a data integration life cycle.